Diabetes is one of the leading causes of blindness in the United States. Patients with diabetes (both type I and type II) are at significant risk for damage to blood vessels in the retina, called diabetic retinopathy, which can cause blurry and distorted eyesight. In many cases this can be treated successfully, but only if caught early enough. 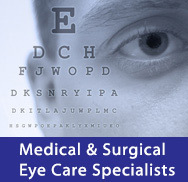 Treatment includes strict glucose control, laser surgery and, in advanced cases, vitrectomy. Diabetic patients are also at an increased risk for both cataracts and glaucoma. It is highly recommended that all diabetic patients have annual ophthalmologic exams to monitor for these conditions.